A good police dispatcher can be counted on to help an officer get through the diciest of situations. Debra Ballard is taking that commitment to another level. 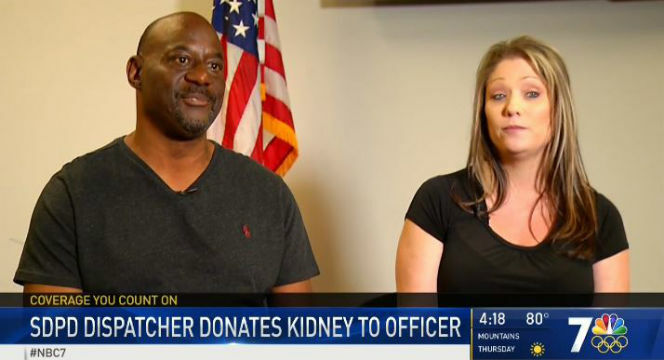 Next week, the 24-year member of the San Diego Police Department‘s Communications Division will give up one of her kidneys to give an ailing law enforcement colleague a new shot at a better, longer life. SDPD Officer Art Calvert, who for decades has suffered from renal kidney disease, has been waiting almost two years for an organ donor — his third, including his mother and sister. He said he was “just overwhelmed” that Ballard would make such a serious sacrifice for him, and do so with such aplomb. “She calls me, just as cool as can be, saying, ‘Hey, I’m a match — when do you want to do this?,'” the officer told reporters Tuesday afternoon outside downtown SDPD headquarters. After deciding she wanted to give a lifesaving gift to Calvert, with whom she once worked at the SDPD’s Northern Division station, Ballard underwent extensive testing that ultimately deemed her an organ-donor match. The two co-workers are scheduled to take part in one final blood test before undergoing transplant surgery Feb. 7. In explaining her weighty decision, Ballard said the nature of dispatchers’ duties creates a kind of “maternal instinct” that makes them “just want to take care” of people.